The Teaching and Learning Center and Faculty Exchange for Teaching Excellence will present “Teaching Critical Thinking to College Students within the Logic of One’s Own Discipline.” on January 27th. The annual teaching workshop is designed to examine critical thinking and how it is used in higher education. 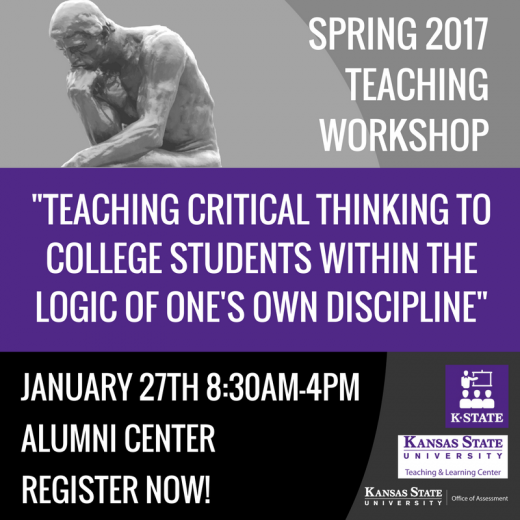 Fred Burrack, Director of Assessment, will begin the day with a brief presentation on what we know about Critical Thinking at K-State. Dr. Gerald Nosich, author of Learning to Think Things Through: A Guide to Critical Thinking Across Curriculum is the main workshop speaker. Registration is open. This event will take place Friday, January 27 from 8:30 a.m. – 4 p.m. at the Alumni Center. We hope to see you there!